That's the premise behind the upcoming Starz series "Torchwood: Miracle Day," which acts as both a new story and a continuation of the original BBC "Torchwood" series. 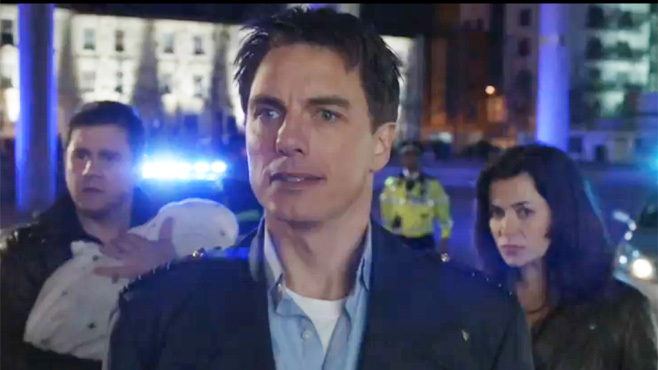 Set to debut in the US on Friday July 8, the series finds surviving Torchwood members Captain Jack Harkness (John Barrowman) and Gwen Cooper (Eve Myles) forced to bring together a new team to investigate the cause behind "Miracle Day." Joining the new Torchwood team are CIA Agents Rex Matheson (Mekhi Phifer) and Esther Drummond (Alexa Havins), along with Dr. Vera Juarez (Arlene Tur). Bill Pullman ("Independence Day") will also join the cast as convicted murderer, Oswald Danes; a man who survives his own execution and rises to become a major threat to the new team. With the premiere episode hitting early next month, Starz has released a new behind-the-scenes video that delves into the new series and explains the premise and characters to fans who may be new to the show. Torchwood begins with a day when nobody dies. All across the world, nobody dies. And then the next day, and the next, and the next, people keep aging, they get hurt and sick, but they never die. The result: a population boom, overnight. With all the extra people, resources are finite. It’s said that in four month’s time, the human race will cease to be viable. But this can’t be a natural event — someone’s got to be behind it. It’s a race against time as C.I.A. agent Rex Matheson (Phifer) investigates a global conspiracy. The answers lie within an old, secret British institute. As Rex keeps asking “What is Torchwood?,” he’s drawn into a world of adventure, and a threat to change what it means to be human, forever. Don't miss "Torchwood: Miracle Day," Friday, July 8 on Starz!